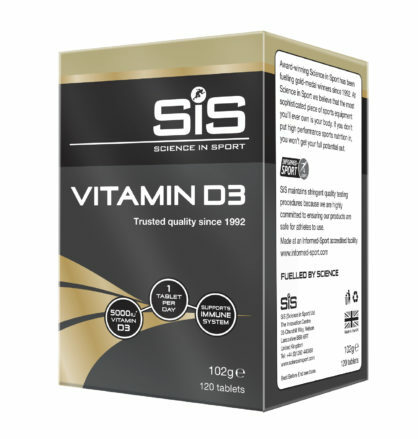 The Science in Sport Vitamin D3 is formulated with 5000iu vitamin D3. Studies reporting positive effects of vitamin D3 supplementation often measure performance and health benefits from correcting deficiencies. Vitamin D3 supplementation has been shown to support immune function. During exercise stress is placed on the working muscle, resulting in muscle tissue breakdown. The adaptive process of repairing the muscle promotes muscle remodelling and drives performance improvements. Supplementing with vitamin D3 may have a beneficial role in skeletal muscle repair and remodelling. SiS Vitamin D3 is tested under the Informed Sport Certification program. This approach involves testing every single batch of SIS finished product, which leaves the Company’s factory, screened against the 2018 World Anti-Doping Agency (WADA) list.